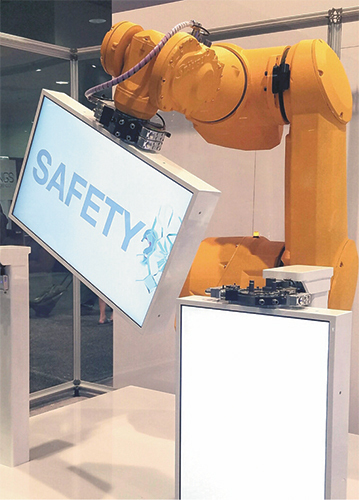 Stäubli leveraged its 60-plus years of experience in connection technology with its FABTECH 2016 booth displaying the latest in robotic-tool-change systems, and emphasizing its soon-to-be-released MPS 260 robotic tool changer. Designed for a range of applications including welding and material handling, the robust tool changer features multiple couplings for air/vacuum connections, and can be equipped with connectors for data and electrical transmission. Very compact dimensions, with a coupled height of only 67 mm, make the MPS 260 the first choice for applications requiring a high number of mating cycles, according to company officials. As the accompanying photo shows, the tool-change module ensures steady, careful handling of heavy yet delicate loads. The MPS, for example, can handle loads weighing to 350 kg.